These tasty and healthy enchiladas are best with authentic corn tortillas. 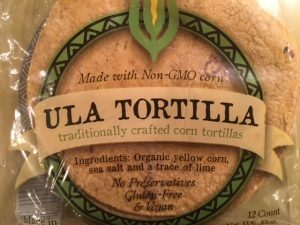 Look for the kind with just a few ingredients like whole ground corn, lime and salt. For best results be sure your tortillas are warm and soft before adding the ingredients; place them in the microwave for 10-15 seconds just before you’re ready to stuff. The tahini sauce adds a nice punch but is optional. Preheat oven to 425F. In a large mixing bowl combine the olive oil, sweet potato puree, turmeric, half of the minced garlic, taco seasoning, salt, zest of the lemon, and 1 1/2 cups of water. Stir well, and ladle a cup of this mixture into the bottom of an 8 x 12-inch (or larger) baking dish. Put the black beans in a large wide bowl and mash slightly so you still have chunks. Mix in the olives and chopped spinach. Lay the tortillas on a work surface, and divide the black bean mixture equally between them. Roll up tortillas, and place seam side down in baking dish. Pour the remaining sauce on top (it will thicken), Cover with foil and bake for 30-35 minutes, until golden and bubbling. While the enchiladas are baking, thin the tahini with 1/4 cup warm water. Whisk in the remaining garlic, a pinch of salt, and squeeze of lemon juice. Top the enchiladas with dollops of the tahini sauce, and the fresh cilantro when they come out of the oven. Serve with a large salad and maybe some brown or wild rice.